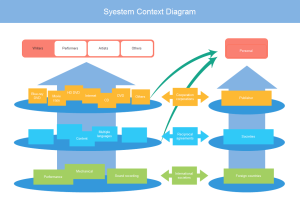 Creating system context Diagram with free templates and examples. System context Diagram has never been easier. A system context diagram (SCD) is used to define the boundary between the system, in system engineering. SCD provides a high level functional view of a system and ensures you have identified any functional needs that impact the non-functional, or architectural, aspects of the design. Edraw system context diagram enables you to model existing or future systems and their interfaces. For more information, please read the article ABC of System Context Diagram. 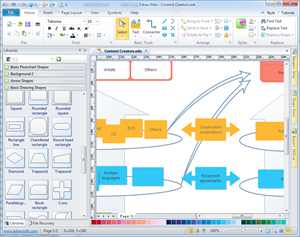 Edraw helps you create system context diagram easily and quickly. With its intuitive interface, easy-to-use drawing tools and lots of pre-drawn library symbols, Edraw manages to provide you with solution that meets any requirements of diagram designing. You can use its automated tools to design and customize your drawing. It has rich color schemes and fill options, and supports real-time previews. There are a variety of pre-defined themes for you to apply too. It's no doubt the most convenient and powerful software in drawing system context diagram. Click here to Download System Context Diagram Software. Learn How to Create Context Diagrams via Edraw. A professional and easy to use system context diagram template is available here for you to improve your own designs.